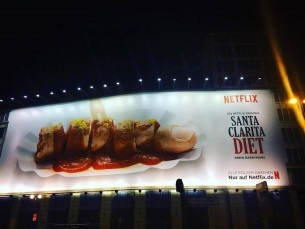 Netflix recently released a promotional advert for one of its original productions called the Santa Clarita Diet. In this strange tale, Drew Barrymore develops abnormal zombie-qualities, including an inability to practice restraint and an insatiable taste for her fellow humans. Since the advert was released in Germany, it features currywurst – a German fast food made of spiced Bratwurst seasoned with curry ketchup. It is often served sliced into bite-sized pieces with chips on the side. Sounds intriguingly tasty. Currywurst enjoys quite the popularity in Germany, serving as a quick snack for on-the-go people. 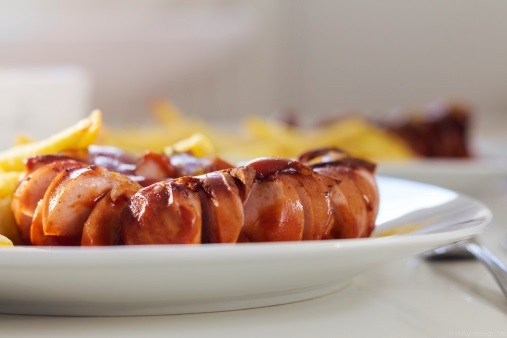 Nearly a billion currywurst are consumed annually in the country with 80% of Germans considering the dish central to their diet. Netflix decided it was a good idea to serve up currywurst human. Needless to say, the advert was not well-received. Upon learning of the public reception, Netflix immediately removed the image from public view. The campaign was halted altogether. Several ads were created for the Santa Clarita Diet, all featuring “just the right balance of fun and gore.” The ad agency’s other stomach-churning ads can be seen on their website. It was invented in the mid-1900s by Herta Heuwer, after she received ketchup and curry powder from British Armed Forces service men stationed in post-war Germany. Through sheer creative luck, Heuwer invented a beloved German dish. The city that the dish originated from is unclear. Rivalling for the title of Currywurst City are Berlin and Hamburg, causing such an upset that a film was made about it – The Invention of the Currywurst. During the mid-1900s, Heuwer had a currywurst food stall in western Berlin, leading many to believe Berlin was the city of origin. A book by Uwe Timm claims that he had currywurst in Hamburg two years before Heuwer’s supposed creation. Resident of Hamburg Lena Brücker is believed to be the true inventor, or so the story goes. There’s even a museum dedicated to the unusual dish.